This red and black striped slouchy beanie reminds me of Dennis the Menace in the Beano. When my sister and I were kids, we used to read the Beano and Dandy comics and when my co-worker asked if I’d make her a hat like this I was instantly reminded of Dennis’s sweater! She sent me a photo of what she wanted and I was able to recreate it easily as it’s just a basic hat, worked top down, in double crochet, alternating two rounds of each colour. There are a few rounds of sc at the brim, where I decreased and snugged it in so it would stay on. The photo above was taken while the beanie was in progress. I was sitting in my favourite tea shop, on my own, with a Cowboy Fog (a latte made with a lovely tea blend which includes black tea, espresso beans and coconut flakes), my crochet project and my iPad. Pretty much my personal heaven! 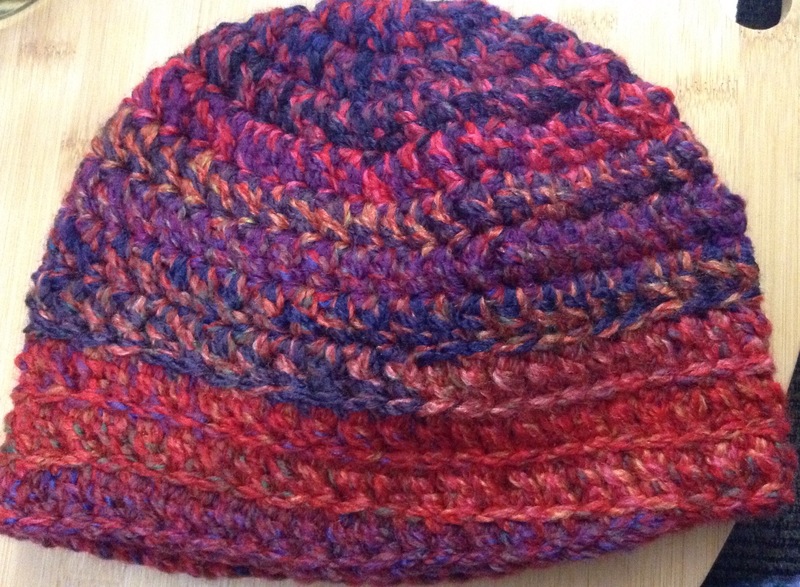 The rainbow slouchy hat in my previous post was the precursor to this hat. The second iteration is wider and longer and my friend at work is very pleased with it. We made a deal that she would buy the yarn, I’d keep the leftovers, and then she’d “pay” me with more yarn. Win Win! I don’t often take commissions, and there are many many discussions online about how much one should charge for handmade stuff. I take each case on its merits. It depends on who’s asking (friend or random stranger), how they are asking (demandy-pants or not), whether I really want to make the item (a simple hat, sure, a blanket that’ll take up 100 hours of my time, no way) and whether we agree on what’s a reasonable deal. So with that out of the way, I had an idea for another project, so I pulled out a bunch of worsted weight yarn and laid it out on the living room floor. I go through phases of yarn acquisition and stashbusting, and I am feeling the need for a stashbusting period. I tend to attract yarn donations from random people and it’s usually vintage acrylic. Time to use some up. The self-striping cakes at bottom right are two Caron Big Cakes, which I thought might be good to throw in to the mix. (Changed my mind on that.) My first idea was to quadruple-strand with a massive hook, and do a granite stitch (1sc, 1ch, sk1) but I didn’t like it. So now I am working up a simple giant granny square. I am using the kelly green every fourth round as I have quite a bit of that, with a dark green, brown, orange, rust, yellow, purple, blue and red. Of course my centre is skewing somewhat, which is typical of large grannies crocheted around and around, but I don’t mind. However I may try turning the work every other round on my next granny, because that’s supposed to maintain a perfect square. Of course it also make it reversible, though I’m not sure if my end-weaving is perfect enough to be invisible on both sides. I have so much black and grey that my brain is working on the next blanket already. I’d like to make one in white, grey and black with small pops of colour. I will need to browse Ravelry for some pattern inspiration. I just came off four days of work in a row. I worked Friday to Monday, which was rather sad because it was Thanksgiving weekend and my husband was off work for three of those days and I barely saw him. Whilst I like my job at the fabric store and my co-workers, and now that I’ve been there four years I (finally) feel confident in my abilities there, I sometimes wonder whether it would be worth looking around for something I could do that didn’t involve evenings and weekends. Or is the grass just looking greener from the other side? Talking of grass, my lawn has greened up beautifully with the fall weather. The cooler temperatures and rain have been very welcome. The squirrels have been busy collecting up my walnuts, though Tai Chi Man found three paint buckets-worth on the ground when he was doing yardwork over the weekend and brought them inside. For the first time in a few years we will actually get to eat some of our own walnuts! He dug the last of the potatoes and also rented this awesome gadget from the sprinkler store which meant that for the first time since we bought this house in 1995 we actually know where ALL the solenoid boxes are for the irrigation system. Some of them have been buried for a very long time, which makes it hard to fix problems. My massive maple in the front yard is showing red this year for the first time. Previously it’s always turned yellow. Weird! And normally I like to see how long we can hold out on turning up the thermostat. I like to aim for the end of October. Well, forget that! This year we had the heat on at the beginning of October, just to get a bit more comfy in the evenings. I am really appreciating having a blanket project to crochet to keep my legs warm – it makes a big difference when you’re enjoying couch and Netflix time! Guess I should get off this computer now. I have a little housework to do and a couple of errands, so I’ll wish you happy crafting and a wonderful week. I obviously got a bit carried away when increasing for this pouf. 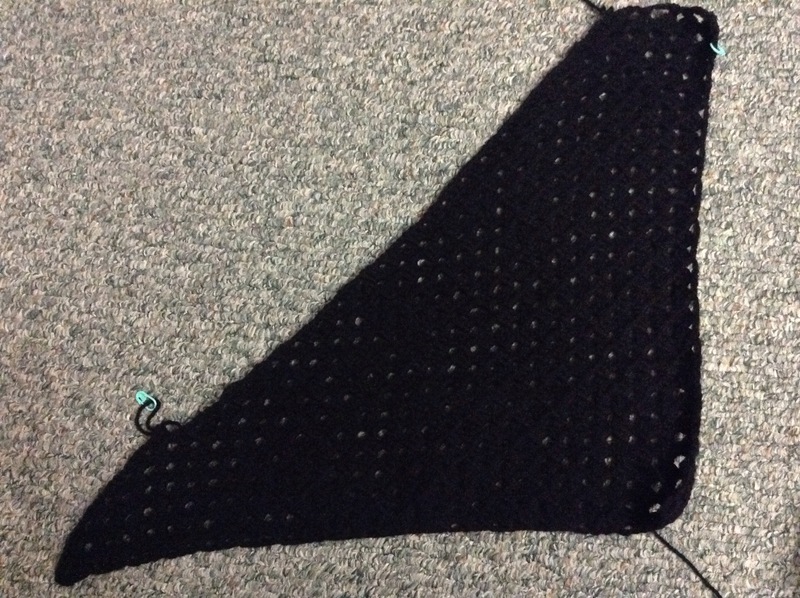 The pattern said to increase until there were eight hdc between increases. No, I thought I knew better, so I went to ten. Diameter was about 26″ so it looked good. Then I started to work without increasing for the sides and it grew to about 35″ across, not counting the edges that flopped inwards when I took this photo. Last night I added more rounds, and my random worsted weight yarn is disappearing fast, and I estimate the sides to be about 8″ deep now. A long way to go yet. I love this project though. I can watch Netflix and hook away, no pattern to memorize, no counting, not even a slipstitch to interrupt the flow. I went to the chiropractor this week. I had a stiff neck for a few days – it felt like a muscle was in spasm in the right side – and it was bearable until I went to work on Tuesday and did a bunch of lifting. We are always moving fabric bolts around, fitting new stuff in, moving older stuff to the discount aisle, lifting and carrying in the usual routine of cutting for people. By lunchtime, my neck was so bad, I could barely sip out of my water bottle or angle my head to take a bite of food. My range of motion was limited to almost nothing. I mentioned it to my boss and she had me do something less strenuous for the afternoon, and thankfully the pain lessened. A visit to the chiro and a friend who does her own brand of healing helped, but then I went to work Thursday daytime and Friday evening and my neck was aggravated again. I have a follow up chiro on Monday, but in the meantime I’m thinking a swim and hot tub might help. I am grateful for a work-free weekend to do family stuff. In fact I must call my mum! Have a wonderful weekend, everyone. I’m so happy with this. I love the colours and the squooshiness and how it brightens up the spot in front of my washer and dryer. I think it weighs abut 5lbs and it certainly burned through a lot of old DK and worsted acrylic that I’d had lying around for some time. Happy Easter/Ostara/Friday to you all. We are celebrating by going snowboarding en famille. We could tell that yesterday people were getting into the long weekend mood because lots of them were leaving work early and creating traffic havoc! I hope it is peaceful where you are. 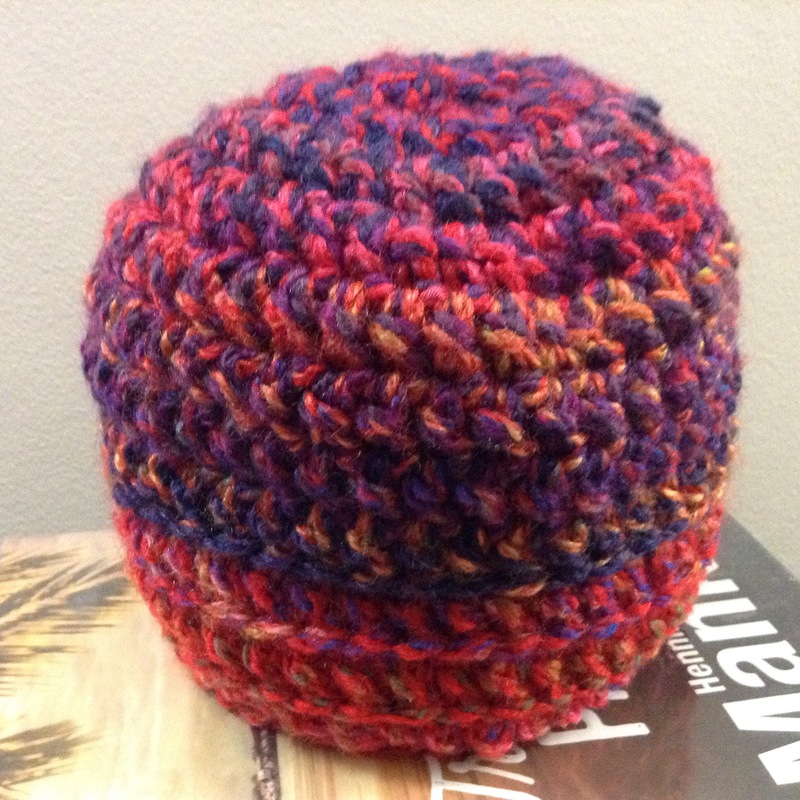 This didn’t take long to make – two strands of James C Brett Marble Chunky with a 6.5mm hook, generic top down crochet beanie, of which I have made many. I’m pleased to have used up two partial skeins from the stash. Tonight’s Netflix show of choice was White Collar, a TV series about an FBI guy and his sidekick, a reformed art forger who is impossibly good-looking! Approximately 17” along that right edge, which is the width of the rectangle or the length of the skirt, depending how you look at it. Yeah, black doesn’t photograph well. So much for this WordPress app, which isn’t working properly again. I can upload certain photos, but others freak the app out, I think, as I get an ‘uploading’ thing cycling at the top of my screen indefinitely. Frustrating! Back to Safari for me. We had a wet and windy day, and the new snowfall we had earlier in the week has all melted. It always amazes me how warm plus 5 feels after minus 5! My day was full of shopping and baking, and the aforementioned crochet, so even though it felt like it was getting dark at 2.30pm I was happy, cocooned in my house with the smell of molasses cookies and home made bread.